Safely Home is one of the most significant novels I’ve ever read. 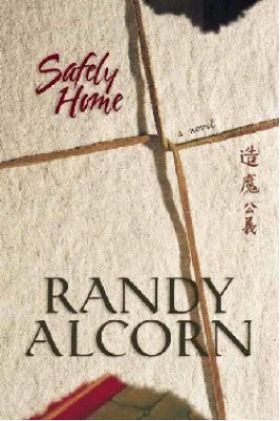 Based on a compilation of true stories, this fictionalized account, Safely Home by Randy Alcorn, is the story of persecuted Christians in 21st Century China. Safely Home is one of the most significant novels I’ve ever read. Based on a compilation of true stories, this fictionalized account, Safely Home by Randy Alcorn, is the story of persecuted Christians in 21st Century China. Two college friends - one from the US, one from China, both Christians - are reunited in China after 20 years. The American is a typical rich, safe Christian. But the Chinese man has spent decades living his faith in an environment that crushes faith. Now, both men are faced with a life and death choice. Captivating, compelling, heartbreaking, and highly motivating, I read Safely Home twice, then assigned it to my high school co-op to read. This book will make you evaluate, are YOU ready to die for Christ? One of the best novels I’ve ever read, it explores so many of today’s issues. Set in present day industrial China.